Tune in to LuxuriaMusic.com for Over Under Sideways Down on Wed. July 3, from 3-5 PM Pacific for YES L.A.! 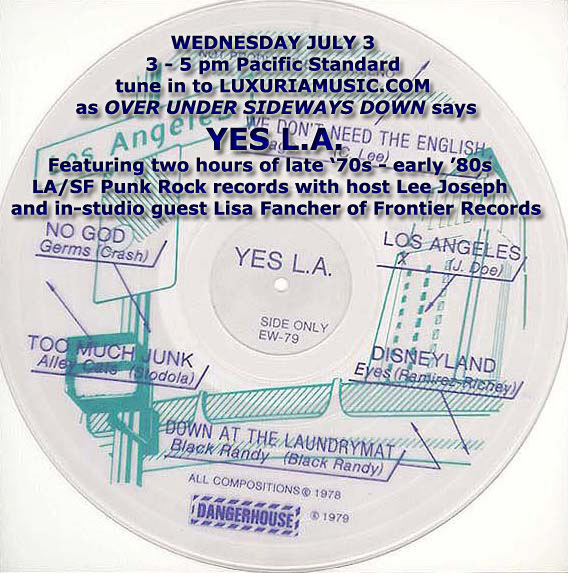 featuring a full two-hours of early Los Angeles and San Francisco Punk with your host Lee Joseph and in-studio guest Lisa Fancher of Frontier Records. We’ll be bringing in a stack of original 45s as well as some reissues from Bacchus Archives and Frontier Record,s and will be celebrating of the re-release of the legendary one-sided silkscreen Dangerhouse Records compilation, Yes L.A. on its 35th birthday! The compilation features tracks by The Bags, The Eyes, The Alleycats, X, Black Randy, and The Germs which were all exclusive to the comp at the time of its’ release. 7/15/13: UPDATE – HERE’S A LINK TO THE SHOW PODCAST!! In the late ’70s, Dangerhouse Records–that most legendary of punk rock labels–released a handful of indispensable 7-inches and two 12-inches: records that everyone knows, worships and collects. One of the 12-inches was Black Randy’s Pass the Dust, I Think I’m Bowie, and the other, released in 1979, was the one-sided, six-song, silkscreened picture EP, Yes LA. The title was a take-off on the seminal No Wave compilation album released a year earlier, No New York, and the Dangerhouse kids even went so far as to include the disclaimer “Not produced by Brian Eno” on the record. The original was limited to 2,000 copies, every one screened by hand and packaged in a clear bag with a white cardboard backing . Frontier Records (with the help of the meticulous Cliff and company at The Factory) has taken great pains to reproduce every detail of the original, from the ink to the bag and cardboard, right down to custom-cut mylar seals for the flap (check out these photos of the “making-of”). Still, there are a couple of difference, but we’ll let you discover them for yourself. 34 years out-of-print, originals of Yes LA have sold for $250 and up. Now you can get your own copy of this fabled LA punk classic and put the gougers out of business! THREE COLOR VARIATIONS AVAILABLE IN THE DIONYSUS RECORDS CART (orders will ship on July 5). When I found out that Los Angeles punk rock legend and personal friend, Alice Bag was about to release her first book, “Violence Girl,” through Feral House, I asked her if she would be interested in doing a double book signing event at La Luz de Jesus Gallery with photographer and friend Dawn Wirth who had just self published “The Bags – Hollywood Forever“ with previously unseen photos of Alice’s group taken in 1978. I had suggested to Alice that I’d love to play bass with her if she were to perform some songs. The night before the event, we rehearsed three songs along with Lysa Flores. A crowd of people showed up to see Alice, filling the gallery spaces and part of the store. After the reading and performance, a long line formed for the book signing portion of the event. Alice and Dawn kept busy for two hours signing books and chatting with fans. Alice was a trailblazer in the early punk era and her experiences growing up in East Los Angeles, being woman in the Los Angeles punk scene, and her life after as an activist, mother and teacher are documented in her book which actually started off as a blog, Diary of A Bad Housewife. Alice’s contact with friends and fans via her blog inspired her to write this book which is not only an interesting read for fans of the early Los Angeles punk scene, but a powerful and empowering read for young people, women and Hispanics no matter what music of choice! Here’s some video of the event – shot by my girlfriend Samantha on an iPod Touch. It was a honor to play with Alice!